Hundreds of brands and retailers, thousands of vendors, millions of consumer goods ­– all connected, mobilised and effortlessly managed. At Li & Fung, the process of supply chain management has been perfected to an art – and it continues to evolve, year on year. As an end-to-end service provider in the supply chain network, Li & Fung manages everything from raw material sourcing and quality compliance to product logistics. To ensure smooth operations over such a vast network, innovation is key. In fact, the company is in the midst of their Three-Year Plan, which puts a stronger focus on speed, innovation and digitalisation. With the company’s business vision evolving fast, their workplace had to follow suit. And that’s where we came in with our innovative office designs. 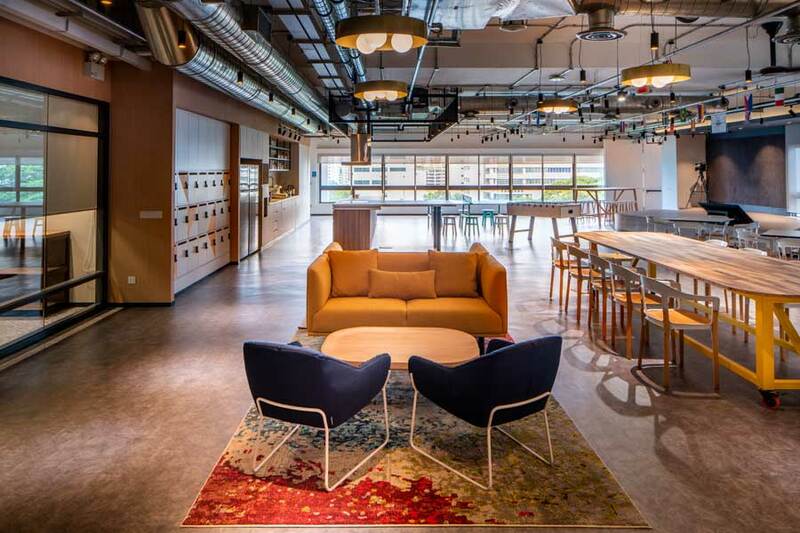 Moving away from their previous model where various teams operated out of different locations in Singapore, Li & Fung sought to bring together all their teams in one workplace. But this couldn’t be just any office! This 22,000 square feet space had to be designed to accommodate the needs of employees from different generations and encourage them to experiment, innovate and come up with more creative solutions. It had to be flexible enough to respond to the company’s changing business needs. And of course, it had to reflect the company’s core values of working as a family, showing entrepreneurial spirit and remaining humble. Uniting multiple teams under one roof is never a simple task. Working in isolation, each team develops their own processes and workplace rhythms. Our challenge was to harmonise these rhythms in such a way, that each team would find it easy to collaborate with each other, without feeling like their unique way of working was being stifled. We decided to tackle this by reaching out to the employees themselves. We conducted interviews with the local teams in Singapore to find out what features of their existing offices were working well, and what needed improvement. Thus armed with relevant knowledge, we set out to co-create the new office with these employees. Thanks to the insights provided by the teams, we were able to custom tailor the space according to their requirements. The old offices had fixed desks and very few collaborative spaces. As Li & Fung sought to move to a more activity-based work style, we introduced moving desks that could be repositioned anywhere in the office. This was particularly useful for the impromptu meetings and ad-hoc discussions that are frequently conducted as per the new model. Working as a family - We introduced a lot of shared spaces and open areas where employees could meet, not only to brainstorm, but also to enjoy some well-deserved breaks. The open design created a certain transparency that made the individual teams feel like they were, indeed, a part of a big family. Promoting entrepreneurial spirit - With an artistic play on geometry, we were able to create a sleek, minimalistic space that is contemporary without being distracting. The flexible design was created to encourage a lot of cross-team interaction. However, we customised the work areas at site and zone levels, to ensure that employees had creative stimulation, as well as peace and quiet, when needed. Humility - We helped Li & Fung reinforce this value by removing the barriers that create distance. The open spaces softened hierarchical boundaries that were more pronounced in their older, traditional set-up. Managers and higher executives can now interact directly with junior employees, thereby promoting collaboration across the vertical structure. Looking to strengthen workplace engagement and bring several units together under one roof? Get in touch with us.